Bread pudding is a classic British dessert and quite tasty of its own accord. However, with a little twist, it gets elevated to a dessert fit for angels. Just make some caramel sauce and add to the custard. It is beautiful and moist and titillating to the nose. If you are like me, I am sure you will finish off spoonfuls of the caramel sauce before proceeding on with the recipe. The basic ingredient here is bread and you must use stale bread as it absorbs the liquid while holding its shape. Absolutely any bread will do. You can use plain white bread slices or challah bread or even a day old croissants. The main thing to remember is the placement of the bread. Challah bread has golden crust and that can be used as an advantage to beautify the pudding. Place the bread slices so that they overlap with the golden part on top. You can make any arrangement you like. I had a baguette lying around for a few days so I sliced it up and simply layered it. Rest assured, there is no difference to the taste. Pour water in a vessel and heat it. Add the white and brown sugar to it. Do not stir or the sugar will crystallize. You are only allowed to swirl to aid the cooking process as of now. Once the sugar has dissolved and starts bubbling, do not move away from the vessel. The sugar syrup will thicken and turn amber. Switch off the gas. Add the cream slowly while whisking the mixture. The syrup will bubble a little but keep whisking. Voila, you have caramel sauce ready. If you want, you can save some to pour on the pudding later on. Add the milk slowly while whisking. Allow to cool a bit. Beat the egg and mix quickly with the caramel to avoid scrambled eggs. Add the vanilla essence. Layer the bread in the baking dish. Alternatively, cut the bread into squares and toss them in the baking dish. Pour the caramel custard on top. Allow to soak for 10 mins. Bake in a pre-heated oven for 20 mins at 180C. Sprinkle confectionery sugar or garnish with caramel sauce before serving. Sometimes you just crave for something sweet at the end of a meal or for breakfast. 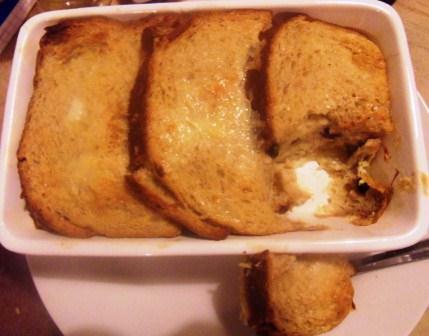 One of the easiest recipes is bread pudding. My mom would make Shahi Tukra which is fried bread dipped in sweet creamy milk. 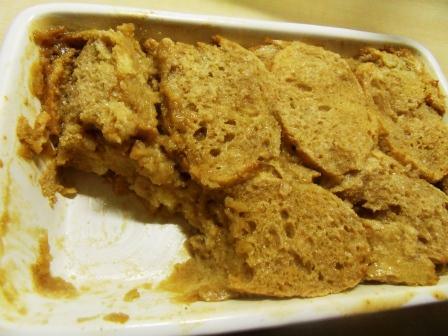 Bread pudding is similar but a baked variation. I have used plain brown bread and skimmed milk but the dish can be elevated with the use of a fancy bread like Challah and half and half. It will be more decadent. Addition of nuts like walnuts or pecans and a bit of drizzled icing on top can add more color to the dish. Break the egg and egg yolk and mix. Add milk, honey and sugar along with vanilla essence. Whisk together. Place the bread slices on a china porcelain baking tray overlapping each other. Place the raisins in between the bread slices. This will prevent the raisins from charring when baked. Pour the milk on the bread. Press the bread slightly so the milk is absorbed and leave it for five minutes. The drier the bread the better as it will soak up the milk better. Bake in a preheated oven at 170C for 30 mins. Serve hot. Tip: You can add orange rind or cocoa or spices like cinnamon and nutmeg also to the bread pudding.